It has been nearly two years since we last took a close look at Pianoteq. Back in 2007, we reviewed version 2.0. We were impressed by it, as Pianoteq represented a whole new generation of technology. To quickly recap, Pianoteq is labeled as a “fourth generation” piano, meaning it is not a sampled piano. It is a modeled piano. While many of us are familiar with modeled guitar amps, effects, and synths, this was the first (and still the only) physically modeled acoustic piano that we know of. Being first in anything is almost always a double-edged sword, but we felt that Pianoteq did a very good job at their goal: creating a realistic piano sound not based on sample playback, full of nuance and expression, that is relatively friendly to hard drive and CPU processing requirements. So… what’s new? Noticeably improved acoustic pianos, and the addition of a whole new selection of modeled instruments including: Rhodes, Wurlitzer, Yamaha CP-80, Vibraphone, and other keyboard-based instruments. Even better, tremolo and limiter effects have been introduced, as well as further controls for sound shaping and customization, including microphone placement (up to five mics!). Overall, we were very pleased with Pianoteq’s sound. Modartt has done a fine job improving what was already an intriguing and solid product. Like its predecessor, Pianoteq 3.04 is both a standalone program as well as a VST, AU, and RTAS plug-in available for the typical Macintosh (Universal Binary) and Windows platforms (and Linux, too!). Happily, it does not require an iLok or other hardware dongle for authorization. Just enter your serial number and authorize online when running the program for the first time to get started. Anyone who has used previous versions of Pianoteq will readily recognize the interface. The top half of the Pianoteq screen has three panels, each of which slide down when clicked to reveal multiple controls underneath. These panels are labeled Tuning, Voicing, and Design. Above the panels are a menu for preset piano sounds, a transport control strip for a rudimentary MIDI recorder/player, and an interesting button called Random that is just that – a button that randomly generates different parameter settings to create new piano sounds. Design has controls for the soundboard: impedance control (will yield longer sounds), cutoff (boosts higher frequencies), and Q factor (controls high frequency duration); piano size (yes, you can make a thirty-three foot (10 m) piano if you want! ); global resonance; sympathetic resonance; and quadratic effect. The bottom half of the interface has controls for equalization and velocity (displayed in graph form to draw your own curve in), output (which allows you in graphical form to place up to five microphones around the virtual piano, and piano lid openness), an effects section including action, tremolo, reverberation, and limiter, and a graphical representation of the entire keyboard and pedals that move in real-time while you are playing them, almost like watching an unattended player piano. Finally, at the top, there is a pull-down Options menu that includes MIDI choices, audio routing choices, multi core processing On/Off, and Add-on status (these are either free or purchased “add-on” pianos that work with Pianoteq, i.e., the Rhodes and Wurlitzer pianos). 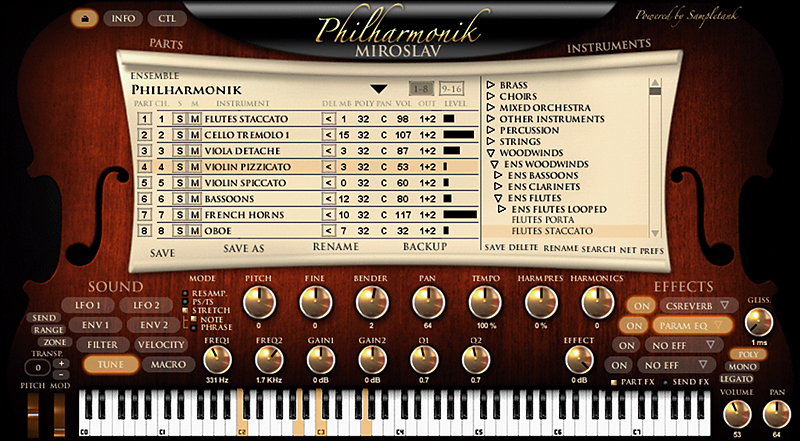 At the top of the screen is a pull down menu for selecting various preset pianos. While there are a number of kinds available (i.e., classic and modern), the Rhodes and Wurly pianos are included as 20-minute demos; for full functionality, these must be purchased. Free add-ins (to registered owners) that can be downloaded from the Pianoteq website include what Modartt calls the non-profit KiviR Project, which includes 10 historical instruments: five pianoforte, two harpsichords, two grand pianos, and one electro-acoustic piano. It just so happens that the particular electro-acoustic piano they modeled is the venerable Yamaha CP-80! Pianoteq now comes with two upgraded pianos: the C3 and M3. As per the Pianoteq website, “The Grand C3 has a warm and colored sound, suitable for classical, romantic or lyrical music. The Grand M3 has an attack and presence that will suit jazz and rock music.” As always, this is a matter of taste, but any given piano can be altered as the user wishes. Finally, there is a Random button that randomly assigns parameters to all the controls, instantly making a unique, potentially useful, sound. One of the times we selected Random, the piano sounded like the reviewer’s 60-year-old, beat up, and detuned spinet piano that belonged to his grandmother. Spooky. We installed Pianoteq 3.04 on an Apple eight-core 2.8 Mhz Mac Pro and tested in both standalone mode and as an RTAS plug-in within Pro Tools LE 7.4.2. Installing the program was no problem. Our total download (not counting the optional other four pianos) was approximately 20 MB. Like the previous version, this was unexpectedly small. The actual installation literally took a matter of seconds. Once launched, we entered our code, and we were instantly playing Pianoteq sounds. As stated earlier, the graphic interface is well laid out, and changes could easily be made to any of the parameters. Despite the mostly-outstanding interface, managing sounds — especially loading and saving sounds, was a bit cumbersome in previous versions. Modartt did a nice job re-organizing the pull down menus and save/load functions so things flowed much more smoothly. Some of the interface is vaguely reminiscent of Arturia’s software products, and that’s not a bad thing. It was easy to find patches, and we could save and load sounds easily. A nice touch is that every preset has a little pop-up description about the quality of the sound, and a graphical rendition of the instrument that is being used. There is a very real sense of historical documentation and preservation in this software, and you can’t say that about too many pieces of virtual software. We have said this before... pianos come literally in many shapes and sizes. And colors. It is this very quality — the subtle (and some not so subtle) colors of a piano that give a piano its character. Previously, this was where Pianoteq excelled, and, to some degree, failed. (See our review of Pianoteq 2.0 here). Last time around, we were impressed by the technology Pianoteq employed, and liked the pianos from version 2.0. However, there wasn’t a complete piano sound that really nailed the whole 88-key piano spectrum convincingly. This time around, the C3 and M3 pianos are a real upgrade from the previous pianos. We felt the piano had a much more convincing quality from top to bottom. Moreover, the strong point Pianoteq had shown before — pianos that felt like they all breathed their individual story, are still here. The pianos sounded high quality and full of life. We were much happier with the overall sound of the C3 and M3 pianos, particularly in the upper and lower registers, where the sound wasn’t quite as good before. On top of the pianos, Pianoteq now has become a more complete product. Rhodes, Wurlitzer (i.e., 200a), and CP-80s are all represented. We found these interesting, and not unlike the earlier versions of the acoustic pianos, both good and bad. The overall sound quality of the extra piano-esque instruments was quite good. However, we felt they suffered many of the same issues as the first version of the acoustic pianos: they sounded very convincing in the middle ranges, but less so in the high and low registers. The parameters are all editable, and tweaking did help, but just like the C1 Piano evolved significantly to become the C3, we feel these first versions, while decent, will see even more improvement in their next revision. Having said that, in a mix, there’s no doubt they would work very well. We also appreciate that because each preset is built from a piano model instead of a huge multi-sample, changing presets is instantaneous – no waiting for a huge multi-sample to load into memory. Again, the sound quality is quite good — we’re just being sticklers. To our ears, we thought the Rhodes was slightly better than the Wurly, though both were good. The tremolo controls were a nice touch, too. While there are distorted presets, a dedicated distortion effect would have been a nice touch. As always, the Random button was a lot of fun to use. Every time we clicked it, Pianoteq created a very different piano sound, which was readily visible with all the parameters now at new settings. Moreover, there is a great deal of info on Modartt’s website. Well worth checking out. 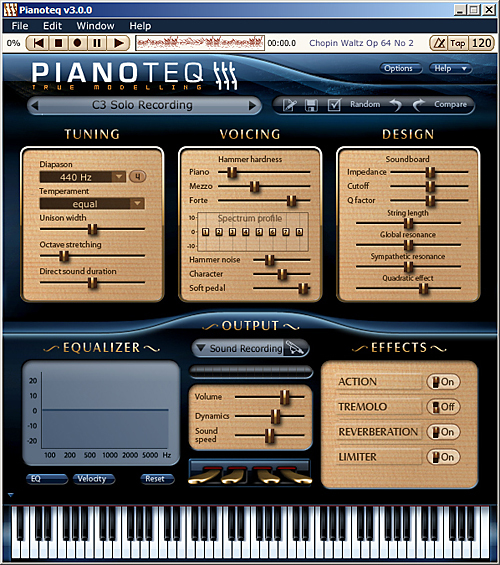 Pianoteq can be purchased direct from the Pianoteq website for 249.00 € (as of August 2009, that’s around $350 USD), and may be found online for less. The Vibes or Electric Piano add-ons are $69. While there might be sample-based piano software out there that sounds stellar for a single application, few programs have the control over fine details within your piano sound like Pianoteq. And at the moment, there is no other program that utilizes the modeling technology Pianoteq employs. It’s hard to believe such a relatively small program (by today’s multi-gigabyte standards) can do so much. We said in our previous review that the original product would get better with time, and it has in a big way.